When you think of Buffalo you think of chicken wings – that’s right, “chicken wings” never “buffalo wings”. The “buffalo” is superfluous. And when you think chicken wing, most people think of Anchor Bar, where the famous chicken wing was invented. Now I’m a bit of a bad Buffalonian and I don’t eat chicken wings…I know, the shame! But I have weird things with food and the way it looks and while they smell delicious, and I like chicken and chicken fingers, chicken wings, with bones and skin, they just look revolting and I can’t bring them up to my face to eat. SO! I can’t indulge in my hometown’s most famous food, and I can’t really comment on where the best place is to indulge. But I listen to the debate, and I can chime in with the general consensus that if you’re looking for the best, the best is NOT Anchor Bar (sure, stop in for tradition’s sake). Most people will say Duff’s out on Sheridan Drive has the best, but if you’re staying downtown, Gabriel’s Gate will often make the list. As you can see from the picture, it’s served in a skinny Collins type glass with…something…probably an olive, on a skewer. 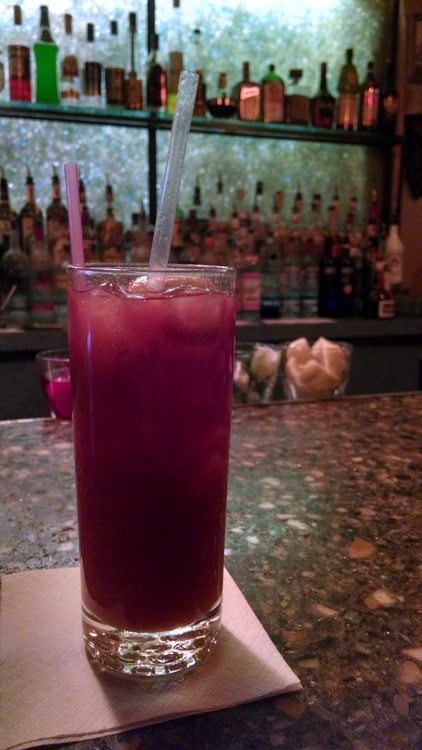 I do remember talking to the bartender about the drink, as Jason told him I was going to be doing this blog and I believe he said they use a house made mix. I do remember it being tasty, but that’s about all I can report sadly. The restaurant is decorated with all sorts of neat stuff, like mounted animals, and is located in one of the original 1864 Tift Row houses on Allen. Fat Bob’s is a great bbq smoke house in Buffalo, in a little one way alley, with a nice patio in the summer. 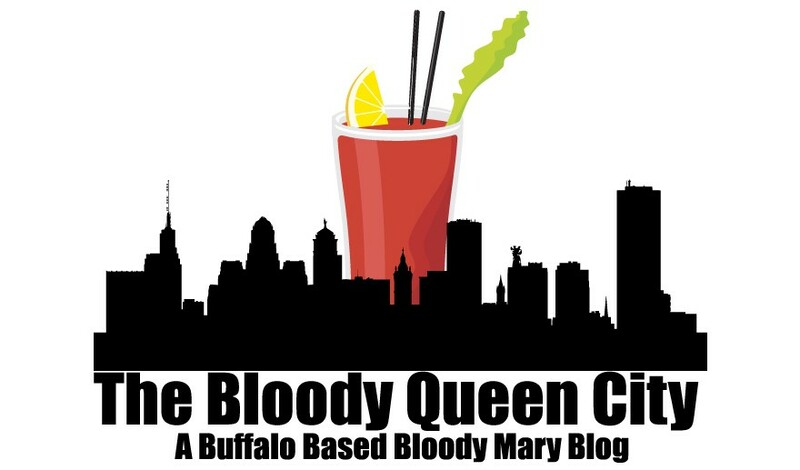 I had a Bloody Mary here once before that wasn’t great, but I was tempted to try it again now that I was going to write the blog. They use a house made mix, and of course I asked for it spicy, but it was hardly spicy at all. There was definitely horseradish in it, and that nose spiciness that comes from horseradish and wasabi, but none of that capsaicin tongue spiciness from peppers or hot sauce. It was more liquid-y than most and fairly bland, all things considered. It has a good base flavor though, it seems like a good thing to expand upon. Like add bbq sauce or something, given that it’s a bbq restaurant after all. 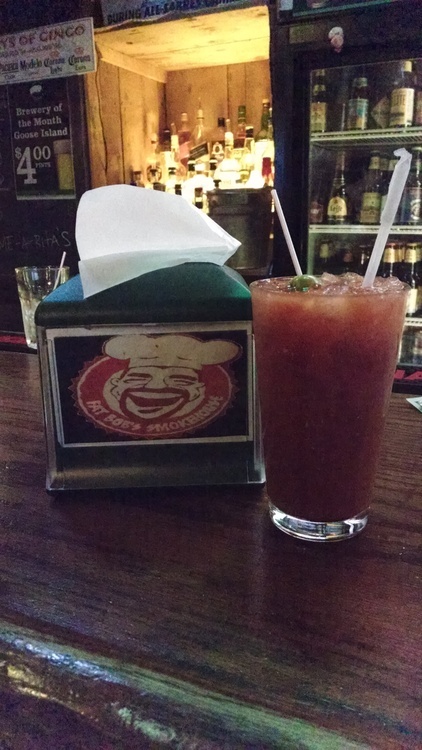 If I hadn’t asked for it spicy, with the horseradish, it would have just been watery tomato juice. $9. It was still fairly disappointing. We started hanging out at the Gypsy Parlor quite a bit for a while before schedules changed and things got in the way. It’s a neat little place that opened on Grant and became a draw to a neighborhood that didn’t have much. 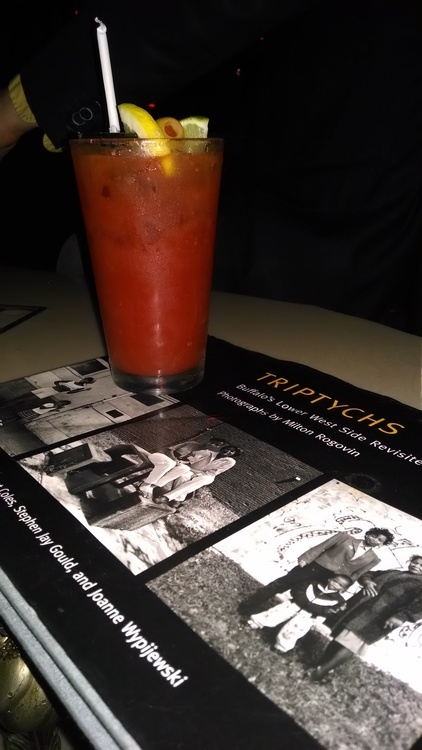 I’ve had a few Bloody Marys at the Gypsy and with the right bartender, it can have the appropriate spice level. 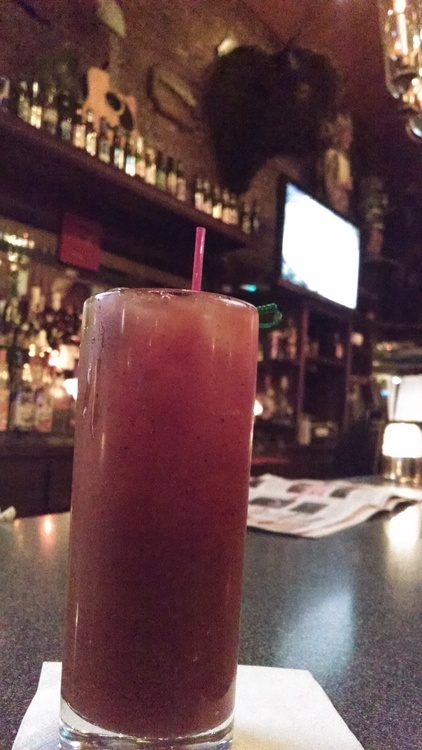 This visit, the bartender was Britney, and it wasn’t overwhelmingly spicy, but it wasn’t just blah boring tomato juice either. Her special ingredient was olive juice, but in general it’s just slightly enhanced tomato juice with lemon, lime and olive garnish, and for $9 it’s not worth it. They have an interesting drink menu with other better options to try if you visit. Lenox Grill in the Lenox Hotel on North is more famous for their insane bottled beer selection (365 beers for 365 days) but we stopped in for some late night food for the first time so I had to get a Bloody Mary. 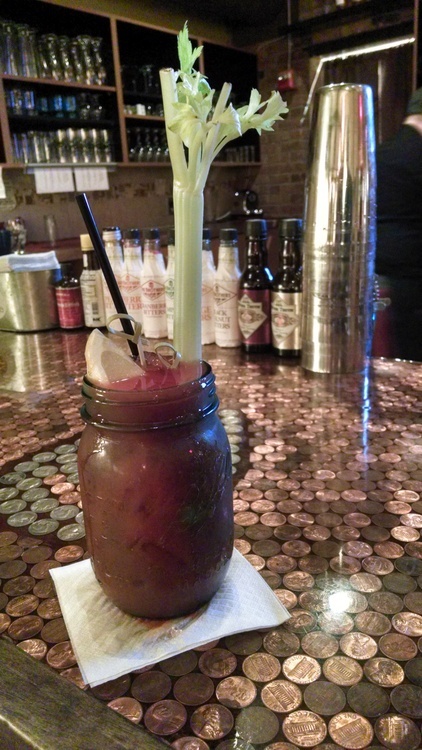 Their website claims the best in town for their Sunday brunch, but really, who doesn’t? 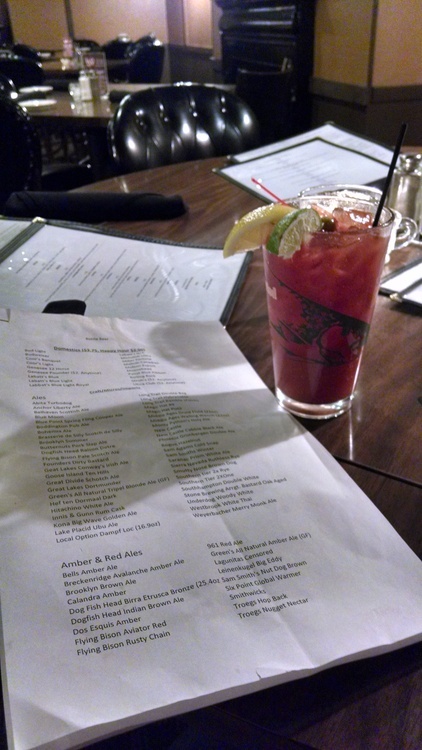 Look at that beer list, there are just pages and pages! 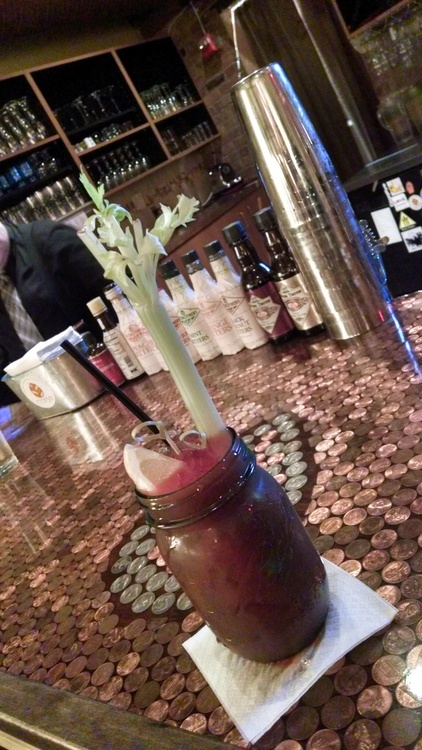 Served in a pint glass, the Bloody Mary had your typical small olive garnish with lemon and lime. It was adequately spicy and peppery. It wasn’t super special but for $5 it was enjoyable and I would order it again. Mothers is an upscale restaurant, that for some reason plays loud club music at night and appeals to a young douchy crowd. Or at least that’s how it seems from the few times I’ve tried to go there. They serve food late though, so we’ve gone a few times intending to eat, but the atmosphere has been a turn off so we’ve never stayed long. 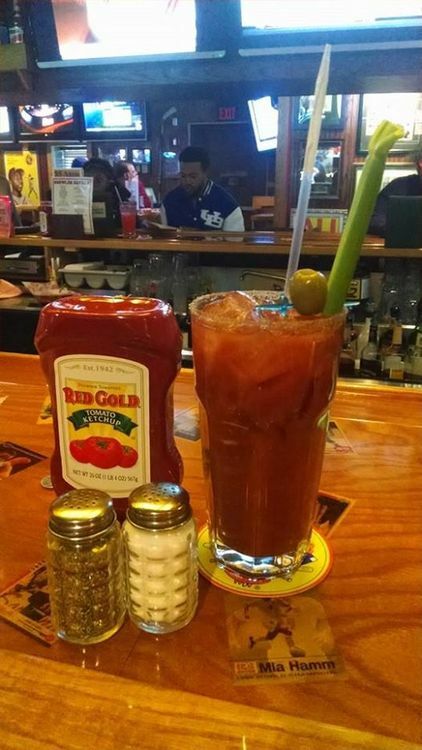 It’s one of these places that has a reputation of serving good food and drink, so I had high expectations for the Bloody Mary I ordered. Served in a Collins glass, for $6, the drink was disappointing. I tend not to ask the bartenders for details on how they make their drinks, so my reviews are just based on what I think I can taste, and admittedly I am not a foodie or any kind of connoisseur. Just remember that. The drink was basically tomato juice with Worcestershire sauce and probably spiced with Frank’s (which as far as hot sauces go, I don’t care for). The spice level was minor, not what I prefer, and only garnished with lemon and lime. There was absolutely nothing special about it, and got big enough for the price. 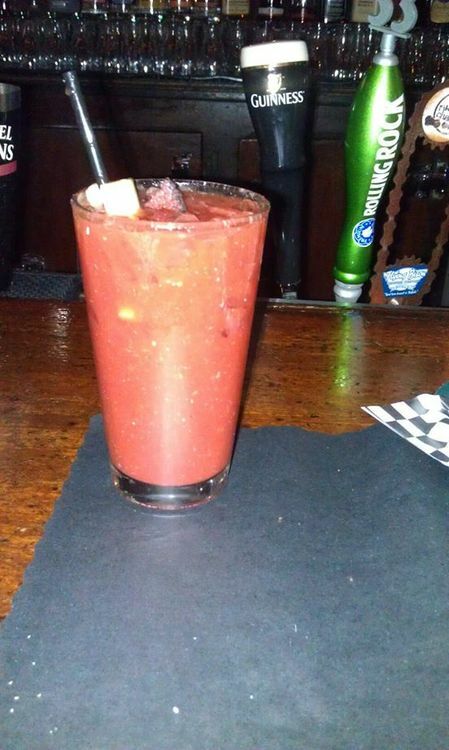 I realize drinks like this will vary by bartender so I shouldn’t be completely biased to Mothers. But given that I don’t particularly like Mothers in general, I see no reason to try it again. A few I found on facebook. 2013-14 was a long, cold winter. We had a dinner date with a group of friends to celebrate a 1 year wedding anniversary only a blizzard hit, so we ended up waiting for our southtown friends for quite a while at the bar. 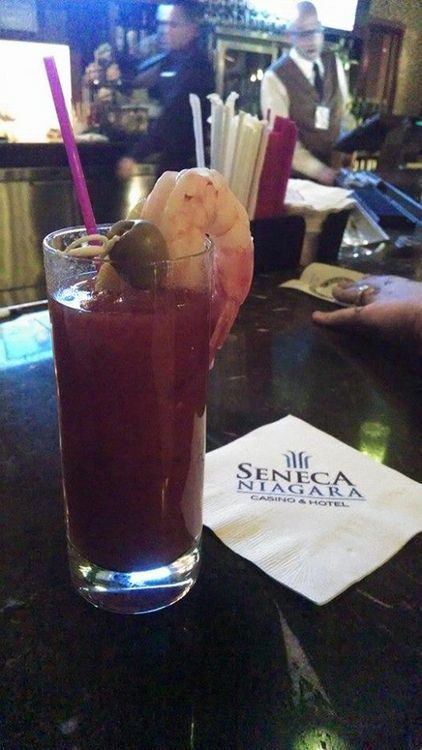 Ok.
Nice big shrimp garnish, in this Bloody Mary from Seneca Niagara Casino. I don’t like seafood, but I’ll eat a shrimp garnish from time to time. Then another blizzard hit up in my neck of the woods, shutting down pretty much everything, yet we still ventured out of the house to the 2 places that were open Target and Tully’s, which had the biggest Bloody Mary I’ve ever seen. I’m not entirely sure the size of the glass, 22 oz I think, and for $4.75….FOUR SEVENTY FIVE! Jesus Christ, how does this place stay in business?! And why do we never go here?